A profession in the field of Culinary Arts may be for you. With this program you'll learn culinary arts application and hospitality, using professional cooking and baking cookies methods. Students will end up experienced in menu planning, use of equipment and time management practices for food service. 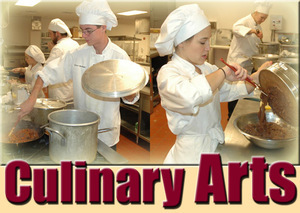 The Culinary arts Program provides training for careers in both the culinary and pastry arts. Our program is made to educate students the knowledge and skills to be successful in their chosen field through on the job practical training in our on-campus restaurant and kitchens, food service management courses and related skill development courses.